Michael R. Bloomberg is an entrepreneur and three-term Mayor of New York City whose innovations in government and philanthropy have made him a global leader on climate change, public health, education, and other critical issues facing America and the world. Born in Boston on February 14, 1942 and raised in a middle class home in Medford, Massachusetts, Michael Bloomberg attended Johns Hopkins University, where he paid his tuition by taking out loans and working as a parking lot attendant. After college, he attended Harvard Business School and in 1966 was hired by a Wall Street firm, Salomon Brothers, for an entry-level job. Bloomberg quickly rose through the ranks at Salomon, overseeing equity trading and sales before heading up the firm’s information systems. When Salomon was acquired in 1981, he was let go from the firm. With a vision of an information technology company that would bring transparency and efficiency to the buying and selling of financial securities, he launched a small startup in a one room office. Today, Bloomberg LP is a global company that employs nearly 20,000 people in 176 locations in 120 countries. During his tenure as mayor, from 2002 through 2013, Bloomberg brought his innovation-driven approach to city government. He turned around a broken public school system by raising standards and holding schools accountable for success. He spurred economic growth and record levels of job creation by revitalizing old industrial areas, spurring entrepreneurship, supporting small businesses, and strengthening key industries, including new media, film and television, bio-science, technology, and tourism. Mayor Bloomberg’s economic policies helped New York City experience record-levels of private-sector job growth often in formerly depressed neighborhoods, even in the wake of the deep national recession. His passion for public health led to ambitious new strategies that became national models, including a ban on smoking in all indoor workplaces, as well as at parks and beaches. Life expectancy grew by 36 months during Mayor Bloomberg’s twelve years in office. He launched cutting-edge anti-poverty efforts, including the Young Men’s Initiative and the Center for Economic Opportunity, whose ground-breaking programs have been replicated across the country. As a result, New York City’s welfare rolls fell 25 percent, and New York was the only big city in the country not to experience an increase in poverty between the 2000 Census and 2012. He also created innovative plans to fight climate change and promote sustainable development, which helped cut the city’s carbon footprint by 14 percent. His belief that America’s mayors and business leaders can help effect change in Washington led him to launch national coalitions to promote gun safety, reform immigration, and invest in infrastructure. He was a strong champion of the city’s cultural community, expanding support for artists and arts organizations and helping to bring more than 500 permanent public art commissions to all five boroughs. Upon leaving City Hall, Michael Bloomberg returned to the company he founded while also devoting more time to philanthropy, which has been a top priority for him throughout his career. Today, Bloomberg Philanthropies employs a unique data-driven approach to global change that grows out of his experiences as an entrepreneur and mayor. In addition to Bloomberg Philanthropies’ five areas of focus – public health, arts and culture, the environment, education, and government innovation – Bloomberg continues to support projects of great importance to him, including his alma mater, Johns Hopkins University. He served as chairman of the board of trustees from 1996-2001, and the university’s School of Hygiene and Public Health is named the Bloomberg School of Public Health in recognition of his commitment and support. Bloomberg has donated more than $6.4 billion to a wide variety of causes and organizations, and committed an additional $1.8 billion, the largest gift in the history of American higher education, to allow Johns Hopkins to permanently accept and enroll students without regard to their ability to pay. As chair of the C40 Climate Leadership Group from 2010 to 2013, Bloomberg drew international attention to cities’ leading role in the fight against climate change, and serves as the UN Secretary-General’s Special Envoy for Climate Action, charged with galvanizing the efforts of local and regional governments, businesses, and civil society. 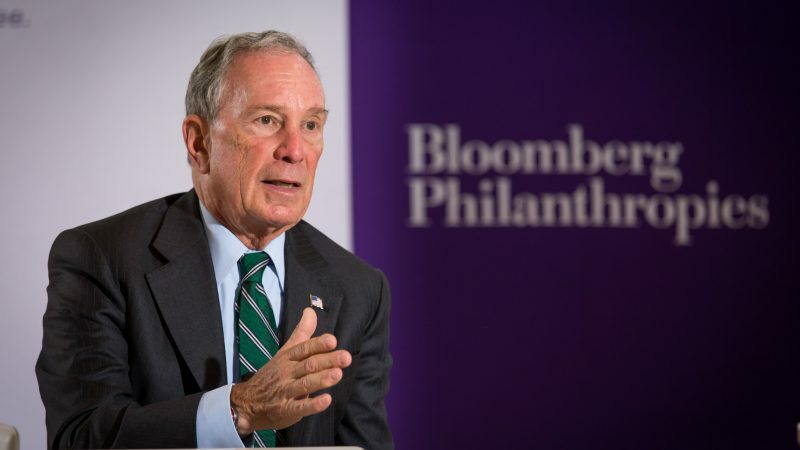 Bloomberg also serves as the World Health Organization’s Global Ambassador for Noncommunicable Diseases, supporting the organization’s push to achieve UN goals of reducing premature NCD deaths by one-third by 2030 and halving the number of road deaths and injuries by 2020. He is also co-author, with Carl Pope, of the 2017 New York Times bestselling book Climate of Hope How Cities, Businesses, and Citizens Can Save the Planet. Michael Bloomberg is the father of two daughters, Emma and Georgina. To date, Mike has donated over $6 billion to a wide variety of causes and organizations. In 2018, Bloomberg Philanthropies distributed $767 million.